On May 30, 2015 I make a return to Paul Henry’s in Hammond,IN. 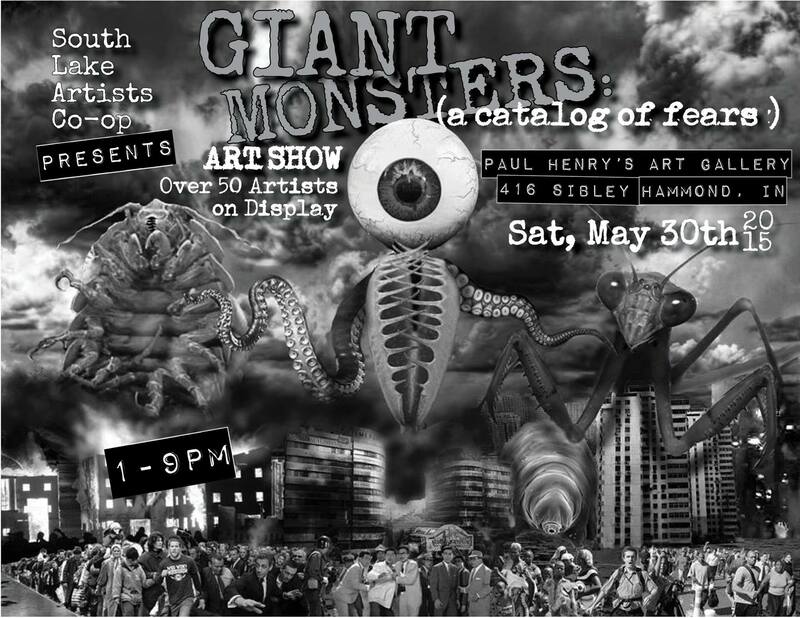 This will be a group show titled Giant Monsters (A Catalog of Fears) hosted by S.L.A.C. “This Spring South Lake Artist’s Co-op, as part of its continuing efforts to be a useful public service, has collected all the available information and diverse interpretations it could find on the subject of Giant Monsters and created our show. Why is this a worthwhile and beneficial thing you ask? Because it’s always good to have some visual idea of what it is that frightens you, or keeps you awake at night, or is the cause of those massive explosions and flashing lights in the sky off in the distance. And that’s not all we’ll have for you! Live music! Recorded Music! The music of laughter! Food! Flying fiends manufactured by the Home School Art Group Kids! The much be-loved collaborative painting! And other surprises and delights for you to enjoy whilst you scrutinize the fantastic work of over 50 artists as they share their explorations from the depths of their imaginations!! !